Carrera de globos is a new online Spanish vocabulary game for learning key words in four categories. Players advance in a hot-air balloon race by answering questions correctly. 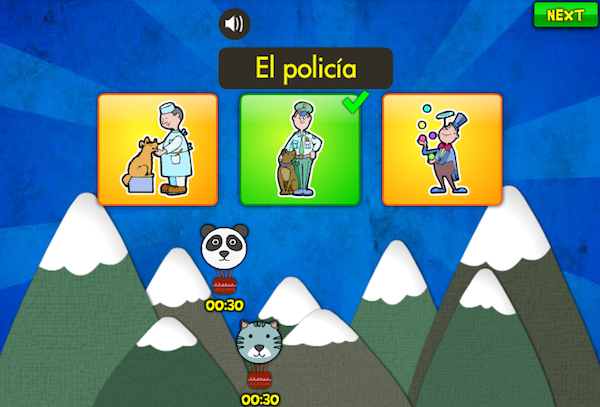 They can practice wild animals, professions, body parts and bugs with this activity from OnlineFreeSpanish. See the end of this post for ideas on how to use the free printable coloring pages on OnlineFreeSpanish to do activities using the game vocabulary in complete sentences. – Use the coloring pages to make a book by adding a sentence to each page. For beginners, use a pattern. For example Hay un león. Hay un camello. or Veo un león. Veo un camello. Kids with more Spanish can describe the picture with an adjective. – If kids color the pictures, they can add a sentence that includes a color word. For example: La mariposa es amarilla. El niño lleva una camiseta roja. – For the professions, use the coloring pages to write a sentence about what each person in the picture has: El profesor tiene tres libros. El piloto tiene un avión. – Cut out the pictures and make a collage that includes a complete sentence about each picture. – Make a matching activity with sentences that describe the picture or that use the word. Kids match the sentences to the picture. – Kids can order the bugs or animals by size and make a comparison: La mariposa es más grande que la hormiga. El elefante es más grande que el león. OnlineFreeSpanish also has several other games and printable word search puzzles for each of these categories.